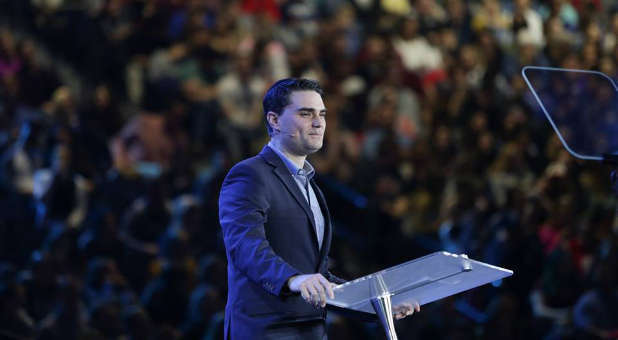 Political commentator and Daily Wire editor-in-chief Ben Shapiro spoke April 25th, 2018 to 11,000 students at Liberty University about the profound biblical values that created America, and why they’re worth defending today. “America was built on a fundamental idea… that human beings are made in the image of God,” Shapiro said. Shapiro argued that those values are under attack because Americans now value collectivism over virtue. Shapiro believes collectivism breeds death and pointed to the case of Alfie Evans, a toddler with an undiagnosed brain condition in the United Kingdom. The British government has forbidden his parents from seeking medical care outside of the country even though an Italian hospital has offered to treat him. The British courts have ruled it is in Alfie’s best interest to die. Shapiro, a vocal pro-life advocate, explained that collectivism doesn’t just murder babies outside of the womb, it murders baby within the womb through abortion. Ultimately, collectivism brings the death of family, community, and society, Shapiro argued. “So, the question becomes how exactly do we go about restoring the Judeo-Christian tradition upon which the nation was built? How exactly do we bring back the philosophy of the Founders and restore their promise?” he continued. Shapiro received a standing ovation for his remarks. The truth wins out. Parents we need to raise kids that don’t just go to church on Sundays. We need to raise children that know the truth about the world, about the universe and know it can only be discovered in God’s Word – The Bible. They need to know the Bible is inerrant. Down through the ages, God has told us through His prophets what would happen in the future. Hundreds of prophecies have been fulfilled exactly as prophesied, proof indeed the Bible is inerrant. That the Bible provides an accurate history of God’s universe. That it not only tells us why, when and how God made it but it also tells us what went wrong and therefore why the universe and us are like we are. That Jesus death on the cross has provided a way (the only way) back into an eternal relationship with our Heavenly Father. That the Bible tells us the end of the story, which is good news for all that have accepted Jesus as their Lord and Saviour, and have been born again by the indwelling presence of the Holy Spirit, but it is incredibly bad news for all those that reject Jesus, God’s free gift of salvation. That they would understand the extent of what Jesus sacrifice has provided. Our Heavenly Father has sent the Holy Spirit to indwell every believer, to be their counsellor, comforter, teacher, to produce the fruit of the spirit in their lives: love, joy, peace, patience, faithfulness, kindness, goodness, gentleness and self control and to provide all nine gifts of the spirit so we can be effective ambassadors for Christ in this world. That they would wake up in the morning thankful for the day, and commit to following the Holy Spirit’s leading, so that they can lay their head down each night, confident that God’s will had been done and His Kingdom advanced and that they had not grieved the Holy Spirit nor quenched His work in their lives. That they would face the storms of life knowing God’s presence and provision. That they would reach for the stars because they know the One who created them has a purpose for their lives. That they will look up when they fall down. Reach out when they need help trusting the indwelling Holy Spirit. That they will be like oaks planted by His stream of living water and bear much fruit. That they would love their neighbours fiercely as their Heavenly Father loves them. That they would see hope when every one else sees hopelessness. That they would share that hope and bring His light into every dark corner. THE ULTIMATE PRODUCT – WHY DON’T PEOPLE BUY IT? We are all involved in selling on a day-to-day basis, often without even knowing it. A dictionary definition of selling is ‘to persuade someone of the merits of’, or, to ‘cause someone to become enthusiastic about’ something. Sales professionals simply take what is second nature to us all, refine it, and apply it to specific situations to maximise their chances of success. What follows is not intended to be prescriptive of how we should witness to the lost. We are all different and, as such, we relate to people in different ways. Hopefully, many of you are already using a lot of the techniques I’m about to share, often without even realising it. But if you’re about to take the first step in your evangelising, or you are frustrated by your efforts to date, I hope this might help. When you witness to an unbeliever, you will be asked questions. It’s important that you can either answer these questions or, at the very least, direct them to a place where they might find the answers. But it’s pointless having all the answers if you never actually take the step to talk to an unbeliever about Jesus. The Gospel message provides an answer to the predicament of every person—we are all sinners in need of salvation. Once this ‘cornerstone’ is in place, we have a sure foundation from which to confidently answer objections to the message. Being equipped with answers will help you to overcome objections and give you confidence to step out and share the Gospel. This is where Creation Ministries International resources are so valuable. Probably the best place to start is with the Creation Answers Book, which has easy to understand answers to over 60 most asked questions on creation, evolution and the Bible. You should also familiarise yourself with creation.com, so that, if you don’t know the answer to a question, you can recommend a place they can go to find the answer (and the search terms the person might use for best results). It can also be helpful to have tracts to give away (e.g. creation.com witnessing cards). Successful sales people will actively seek to generate selling opportunities. Moreover, the Great Commission is a command – “go and make disciples of all nations” Matthew 28:19. Making a sales presentation will usually involve an invitation, either in the form of an appointment, or at least a request for information about a product. Evangelism is similar—yes, we should always be looking for opportunities to start a conversation about Jesus (the easiest way is simply to tell (or, remind) people you’re a Christian). But ‘everyone who asks’ implies an invitation to give the reason for the hope we have. The invitation(s) might be obvious: e.g. “Why are you a Christian?” Or they might be subtle: e.g. a throw away comment about Jesus, Christianity, another religion, or a news item with an evolutionary bias, etc. You just have to be prepared to recognize them when they arise. And don’t beat yourself up if you miss an opportunity (we all miss opportunities). Put it down to experience and work out ways to be better prepared next time. Successful selling requires persuasion, not pressure, and this is even more the case with evangelism. In most cases, you will effectively be telling someone that their whole worldview is wrong. This can be very confronting! Gentle persuasion is less likely to cause offence and, in the event of a negative reaction, is more likely to leave the lines of communication open for future discussions. Respect is equally important. First, we are all made in the image of God, with responsibility for our decisions. We must always respect a person’s right to choose their own destiny, no matter how wrong we believe that choice to be. Second, respect implies a relationship. You cannot respectfully tell a person their worldview is wrong if you don’t know what that worldview is. Before sharing the Gospel with someone, it’s important you take time to get to know them (if time allows). The easiest way to do this is to ask questions and be a good listener. We humans like to talk about ourselves and asking questions invites people to do just that. In the process, you will have the opportunity to demonstrate a genuine interest in who they are and what they believe. They, in turn, will be more comfortable in speaking to you, and will be more likely to listen when you speak to them. Ask open-ended questions that require more than a simple ‘yes’ or ‘no’ answer. For instance, questions prefaced with ‘Who?’ ‘What?’ ‘Which?’ ‘Why?’ ‘When?’ ‘Where?’ and ‘How?’ Look for common interests and shared views and highlight these as they come up (as Paul would have done). If the conversation becomes more worldview-centric, ask clarifying questions and make a mental note of anything they may tell you that you can use to make the Gospel message more personal to them and more relevant to their life. Our ultimate aim should be that the people we witness to will place their confidence and faith in Jesus as their Lord and Saviour. This is the hope that we have for ourselves, and the hope we should have for others. It may not happen at the first meeting, the second meeting, or for many years. We might not even be present when the decision is finally made (if it is made at all) but this must be our goal from the very beginning. To this end, the most important part of witnessing is the Gospel presentation and you need to get it right. Prepare, commit to memory, and practice your Gospel presentation. It should be biblically sound, containing all the major features and benefits of the Gospel message, starting with the ‘very good’ Creation of Genesis 1. It should be logical, easy to understand and concise. It should explain the features of the Gospel, but should focus on the benefits, the reason(s) for the hope that we have. To use a sales analogy, no-one buys a refrigerator because it has a motor, insulated walls and shelves (the features). We buy a refrigerator because it keeps drinks cold and food fresh (the benefits). Don’t cut corners. Just as you shouldn’t assume anything about another person’s worldview, don’t assume they have a clear understanding of the Gospel, even if they tell you they do. In this increasingly secular world, if an unbeliever has any understanding of the Gospel at all, it is likely to be a distorted version. As you grow in confidence, you may be able to weave into your Gospel presentation some of what you have learnt about the person you’re witnessing to. A good sales presentation is designed to turn ‘wants’ into ‘needs’, the theory being that a person is much more likely to ‘buy’ if they are convinced they need something, rather than just wanting it. This same process can also be applied to evangelism. For example; most honest people, when confronted with questions of mortality, will admit they want to know what happens when they die. You can point out that, logically, they need to find the answer to this question before they die, because, once they’re dead, it’s too late to do anything about it. Competition is a fact of life. Sales people are always on the lookout for ways to convince potential clients that what they have to offer is superior to the opposition. Successful sales people do this by highlighting the positive features of their own product and subtly, rather than overtly, undermining the competition. However, if there is anything in a competitor’s sales presentation that is perceived to be inconsistent, or false, it will be (and should be) ruthlessly exploited. How much more will this be the case with evangelism, where we must contend with an enemy who “masquerades as an angel of light” (2 Corinthians 11:14) but also “prowls around like a roaring lion looking for someone to devour” (1 Peter 5:8). Don’t make Satan’s job any easier. Everything about your Gospel presentation, and your answers to the questions you are asked, must be internally consistent (without contradiction). In doing so, you give yourself the best opportunity to convince people that the Christian worldview, alone, is externally consistent (true). This is where those who attempt to fit evolution and millions of years into the Bible get it so wrong. By attempting to make Christianity conform to the world’s version of origins, they open the door to accusations of inconsistency and outright, deliberate deception. If the Bible can’t be trusted in the first chapters of Genesis, why would anyone trust what it says about Jesus? Militant anti-theists will always rage against the Christian worldview simply because they have an anti-God agenda. We do ourselves, those to whom we witness, and the God we serve, a disservice by trying to appease them. Keep a ‘clear conscience’. Let Satan and his minions argue the benefits of their own worldview rather than allowing them to point out inconsistencies in yours! When a decision is made to buy, a good salesperson will have a procedure in place to finalize the sale and an after-sales support program designed to ensure long term buyer satisfaction. In the same way, you need to plan what you will do when someone indicates that he/she is ready to commit to Christ. First, and foremost, you should encourage them to acknowledge and confess their sin (1 John 1:9), turn to God in repentance (Acts 20:21), and believe in Jesus for remission of their sin and for salvation (Romans 10:9, John 3:16). Then, help them to put in place the tools they’ll need to grow and defend their newfound faith. This should include: encouraging them to read the Bible and pray, helping them find a Bible believing church in their area, and suggesting they seek out Christian friends and join a Bible study group. You might also offer to stay in touch and disciple them. Last, but not least, make sure they know where to go if they have questions. Introduce them to CMI materials; Creation Magazine (you might start by giving them one of your back issues), the Creation Answers Book, and the wealth of biblically based, God-honouring resources at creation.com. That way, they too will be prepared to give an answer. One last piece of advice (this one’s definitely not learnt from the business world); before you do anything, cover yourself in prayer. Pray for opportunities to share the Gospel and pray that you will recognise these opportunities when they present themselves. Pray for the boldness to speak God’s truth into the lives of friends, family, workmates, new acquaintances, etc. Pray that you will have clarity of thought and mind and that you will be able to answer the questions you might be asked. Pray for open hearts and open minds, that your efforts will bear fruit and that you will have success. And pray, in particular, that you, and those you witness to, will be protected from the arrows of the enemy. There are many internal indicators that Biblical writers were referring to actual events. The authors provide specific dates, identify locations, describe geographical features, or point out man-made monuments that were still existing when the original readers read the text. Actual events such as the Exodus of the Israelites from Egypt, the giving of the Law to Moses, or the anointing of King David are the bedrock on which every type of Biblical writing is based. Revelation is God’s act of revealing Himself through His words and actions to people throughout the history of the world. Although General Revelation provides us enough knowledge to know that God exists, it does not provide a record of His words and deeds in time. This is why Special Revelation is so important: we cannot know what God has actually done in the past unless He specifically tells us. 1. From the beginning of time, men and women were placed in the world so they could perceive God’s power and divinity in the creation and worship Him. What is the truth being suppressed by certain men? The truth of General Revelation that God is powerful and divine, and should therefore be worshipped by everyone. Because this truth has been revealed through what God has made, those who reject it are without an excuse. What is “plain to them,” and how is it perceived? God’s invisible attributes are made visible through the creation, specifically His eternal power and divine nature. These can be seen by looking at the world around us, whether it is looking at a sunrise, seeing a mountain peak, watching the way a bird flies, or studying the complexity of DNA. Every aspect of creation reveals something about God. What is the purpose of God revealing Himself through His creation? He desires men and women everywhere to know Him and worship Him. In the verses immediately following this statement, Paul explains what happens to people who choose to worship the creation instead of the Creator: they eventually turn to sexual sin. Why does Paul say God’s attributes have been clearly perceived “ever since the creation of the world”? He wants to show there has never been a time when man was not present on the earth to worship God. Paul is referring back to Genesis 1 and the creation of Adam and Eve on the sixth day of creation as the starting point for the worship of God. Is there a connection between those who reject God’s General Revelation and the desire to use intellectual disciplines (such as philosophy and science) to argue that He does not exist? Yes, these are examples of different ways of suppressing the truth. People are turning to the creation to worship it instead of God. That worship can take many different manifestations, whether bowing down to an idol made of wood or an idol made of intellectual ideas. In the case of modern science, many people have taken the natural world and set it up as the maker of all things. Atheistic evolutionary theory is the idolatrous idea of the progressive self-creation of all things. 2. God spoke to select men who accurately recorded His words and actions, as well as the events surrounding them. Why is it important to God that His words and actions, as well as the events surrounding them, be recorded? God reveals Himself through words and actions at specific places and times; they are a part of history. For instance, the Ten Commandments were spoken three months after the Israelites left Egypt. They are God’s verbal commands intended to guide His people, so He instructed Moses to write them down for future generations to remember and follow. God also instructs Moses to write down the stages (or steps) of the people on their journey. He wants them to remember how He guided them, protected them, and provided for them at a certain time and place, so they can trust that He will do it again in the future. How important is Special Revelation for knowing what God said and did in the past? God’s Special Revelation is the only way for us to know exactly what God has said and done in the past. When it comes to questions about origins, therefore, it is very important that we start with Special Revelation. As God’s interactions with Moses on Mt. Sinai reveal, He was intentional about what He wanted Moses to write down. We must therefore be careful to base our understanding of history on what God has revealed to us about it. Can General Revelation be used to know what God said or did in the past? No, General Revelation is intended to reveal the invisible attributes of God such as His power and nature; it was not intended to reveal His words and deeds. In a sense, General Revelation is “ahistorical” since it occurs in the same way for all people at all times. There are some people who say the Bible is “true” but that the events it describes are not actual history. Is there a problem thinking this way? When talking about the death and resurrection of Jesus, Paul points out that if it did not actually happen, there is no hope for salvation. We all naturally understand that actions have consequences: if we don’t fill up our car with gas, it will stop running; if we lock a door and lose the key, we cannot open it. Truth is therefore connected to reality: if something is said to have happened, but did not, then it cannot also be true. 3. God expects us to know the events recorded in the Bible and accept them as history so we can direct our lives according to what He has said and done. Why does Jesus quote the account of the first marriage in Genesis 2 to address the Pharisees’ question about divorce? Jesus looks at the creation of the first man and woman—and their marriage in the garden—as the model for all other marriages. Adam and Eve were therefore the standard for all marriages coming after them. Why is it important for Jesus’ argument that the account in Genesis 2 be historically true? Jesus is making the claim that what God did in the garden has direct consequences for all marriages after it. If the original marriage of Adam to Eve was not real, then it does not have authority over any other marriage. Jesus, however, points out there was an original structure to God’s created order, and divorce was not part of it. How important are a real Adam and Eve to the life and work of Jesus? They are absolutely essential. Luke 3 shows that Jesus connects His lineage directly back to Adam as the first “son of God.” The consequences of Adam’s sin were the reason mankind and the world became corrupted and in need of salvation. Jesus came to earth to save us from the results of Adam’s sin. The doctrine of revelation is the foundation of how we know who God is and what He has done in the world. Revelation, therefore, is where we must start when considering the question of origins. General Revelation reveals God’s invisible attributes to the entire world, but it cannot tell us anything specific about history. It is therefore left to Special Revelation to reveal God’s words and actions in time. Together, these two types of Revelation provide us an accurate, yet inexhaustible, fount of knowledge about creation and God Himself. Taken from IsGenesisHistory.com. The videos are a must view. Use them to teach the inerrancy of God’s Word. The Bible tells us the battle is intense in the “last days”. There will be a great falling away in the church. WHY IS THIS DISRUPTION AND FORCE NECESSARY? Victory in this battle is never found at a negotiation table filled with compromise and conditions. It is past time for marketplace believers to step into our co-destiny with Jesus – to take back lost territory. The battle will be fierce, but Jesus said, “when these things begin to happen look up, lift up your heads, because your redemption draws near.” Luke 21:28 His return is not too far off. Come out of apostate churches and ensure we raise God fearing children. Resist political, governmental or special interest group pressure to lower our standards or behaviour. We must hold to God’s inerrant Word. One of the most outstanding features of the Bible is that within the text we find constant reminders of the amazing plan of God established even before the creation of the cosmos. His plan is told to us over and over, as we read through the text, page by page. The more one reads the Scriptures, the more these “veiled” prophecies are revealed, and the more our faith in God is established line upon line. Many of these prophetic clues are placed within some of the sections of Scripture that many of us skim through on our way to the more exciting portions. It is also important to remember that the Bible was not meant to be read as if it were a linear timeline, but as a cyclical experience. With this in mind, every page we turn connects with those pages that come after and with those that came before. These “veiled” prophecies seem to simply be a part of the text being spoken or written as we first read them, but when we add them to the fullness of the Scriptures, they become hints of promises and fulfilment of promises. Note the top of the ark was called the atonement cover. In John 11:12-14 on resurrection morning when Miriam looked into the open tomb where Jesus had been laid what does she find? She finds the place where Yeshua, our atonement, was placed on top of, and two angels who stood one on one side and one on the other. Many, many “veiled” prophecies are placed in the Scriptures so that as events take place, we will recognise the plan of God being fulfilled before our eyes.